Do you ever get in trouble? No one wants to be blamed. So you try to make an excuse and get out of it. “It wasn’t really my fault” or “I didn’t know.” But is that the best way out? Let’s see what lesson the King has to teach us in His garden today. Oh, look there! The Gardener must have got a new dog. See him pulling around on the end of that leash? He looks eager to chase the palace pigeons or sniff through the flower beds. What is the Gardener planning to do with him? Let’s go over and see. We watch as he gives our furry friend a little tug on the lead, but Faithful only jumps and barks. He doesn’t want to leave us. Maybe we should get out of the way? The Gardener steps forward again. “Come,” he says in a calm, cheerful voice and pops the lead. Suddenly Faithful seems to understand. With a wag of his tail he bounds to his Master’s side. 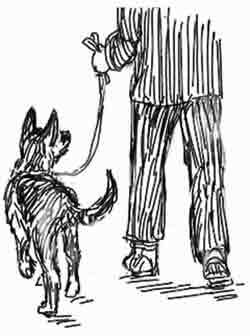 Come means, “stay with me.” Now we see a pretty picture of a happy dog walking by his master’s side, ready to listen! Did you notice that when Faithful crouched down and whined he didn’t learn his lesson? The snap on his neck hurt, but it was just to get his attention. It is the same way for us. If we have been corrected, should we sit down and fuss? No, that doesn’t help at all! Punishment is given that we might learn how to obey and do well. Instead of, “Why do I always get in trouble?” let’s remember Faithful. How much better to look up at Mom or Dad’s face and say, “I am sorry. Please show me what I should do.” When we learn that the punishment is good for us, there won’t be so much reason to be punished. Don’t you want to learn your lessons quickly?